DIE Martis, 8 die Januarii. Message from H. C. for Conferences on Two Bills. Epus. Rochester. Johannes Ds. Robertes, Ds. Custos Privati Sigilli. The Earl of Dorset reported, "That the Committee having (by the Averment of the Record) had proved before them the Conviction of Mary Bishop, upon Indictment of Perjury, upon whose Testimony Francis Scawen was unjustly convicted; the Committee are of Opinion, That the Bill for restoring the said Francis Scawen in Blood is sit to pass as it is." Which the House Agreed to, and ordered the said Bill to be engrossed. To desire a Free Conference, concerning the Bill against importing of Irish Cattle, &c.; also a Conference upon the Subject-matter of taking the Accompts of Public Monies. That this House appoints to give the House of Commons a Free Conference concerning the Subject-matter of the Bill against importing of Irish Cattle, To-morrow Morning, at Ten of the Clock, in the Painted Chamber; at which Time and Place also this House will give them a Conference, concerning the Subject-matter of taking the Accompts of the Public Monies. The same Lords are appointed to report these Conferences, as managed the last Conferences concerning these Matters. 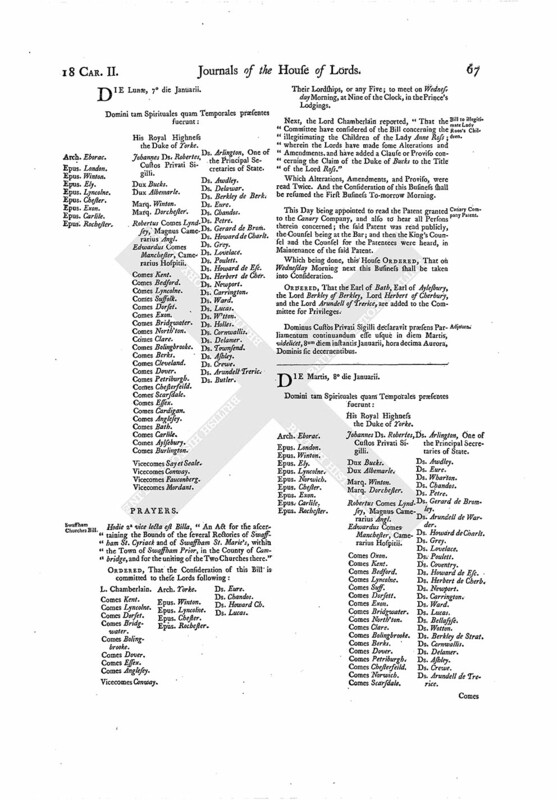 ORDERED, That the Earl of Carlile is added to the Committee for the Bill concerning the Lead Mines in the County Palatine of Durham; and the Lord Awdley, Lord Arundell of Warder, and the Lord Ward, are added to the Committee for the Bill concerning Mr. Myldmaie's Estate. Next, the House resumed the Consideration of the Report made Yesterday, concerning the Alterations and Proviso added by the Committee to the Bill concerning the illegitimating the Children of the Lady Anne Rosse; and, after a long Debate thereof, the said Alterations were read again, and Agreed to by the House. Then the Question being put, "Whether to agree with the Committee in this Proviso?" 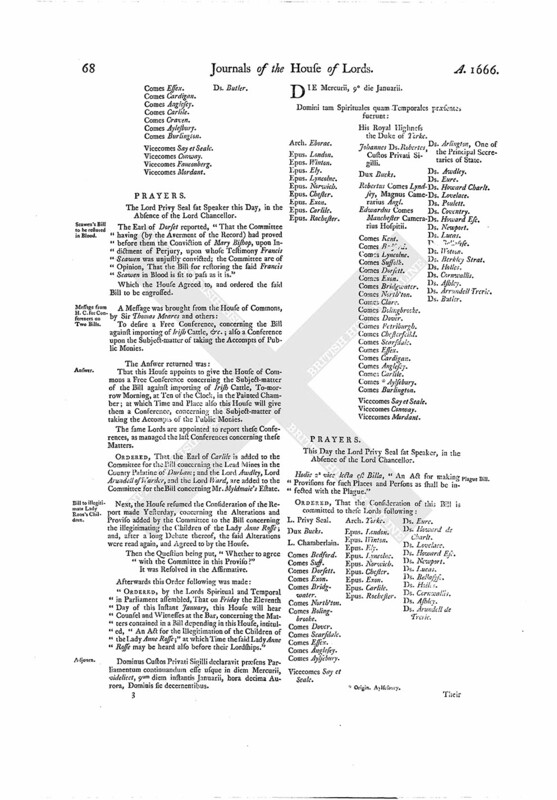 "ORDERED, by the Lords Spiritual and Temporal in Parliament assembled, That on Friday the Eleventh Day of this Instant January, this House will hear Counsel and Witnesses at the Bar, concerning the Matters contained in a Bill depending in this House, intituled, "An Act for the Illegitimation of the Children of the Lady Anne Rosse;" at which Time the said Lady Anne Rosse may be heard also before their Lordships." Dominus Custos Privati Sigilli declaravit præsens Parliamentum continuandum esse usque in diem Mercurii, videlicet, 9um diem instantis Januarii, hora decima Aurora, Dominis sic decernentibus.